Well, I'm finally getting to my 2 Peas challenges. The calendar day I used for this is Feb 1: Record a moment in time. I saw this and the first thing I thought of was Crop Addict's Feb kit. It had a couple of calendar pages included. I decided to use the Fancy Pants one and it was so pretty, I wanted my moment in time to be about my wedding day. This page actually came together pretty quickly for me. Usually, I fiddle around with a layout for a few hours before I finally decide on placement, etc. The longest part of it was waiting for the dimensional adhesive to dry on the chipboard letters. First, I scanned one of my wedding proofs and then enlarged it (Brannon just bought me an Epson V500...that thing scans like you wouldn't believe!!). I fiddled around with it in PSE and then decided to just keep it color...was going to make it black and white but I love all the colors playing together on this one. 1. Print photo and cut out leaving a little border. 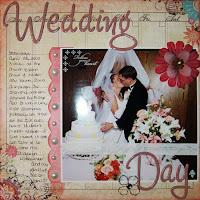 Add rub-on photo corner (Stampin' Up!). Attach self-adhesive ribbon--says What a wonderful world this is now that I've found you!--(Die Cuts with a View). Cut a 2 inch by whatever your photo is of patterned paper (Fancy Pants Botanical Bluebell). Use a large corner rounder (EK Success) and make scallops. Ink with chalk ink (SU!). Adhere to side of photo. Use glue dots and adhere 1/2 pearls (SU!) to scallops. Adhere to background (Fancy Pants Botanical Wallflower). Ink background with chalk ink (SU!). 2. Use a marker (SU!) to color edges of chipboard letters (Basic Grey Wilma). Ink letters with chalk ink (SU! )...use two coats, if needed. Cover chipboard with dimensional adhesive (SU!). Let dry and then remove backing and adhere to page. 3. Color flowers with brush tip markers (SU!). Layer and attach to upper-right corner of photo. 4. Make flower out of wire and thread beads as you go. Wrap center with leftover wire and trim off. Wrap brad around the center and poke through paper to attach to page. 5. Put a rub-on (SU!) in bottom-left corner of background. 6. Use lines on the background page for journaling. Pencil in if you want and write over the pencil lines with a journaling pen/marker (Zig Writer-chocolate, EK Success). Erase pencil lines. That's it!! Let me know if you have any questions about anything! oh what a sweet LO!!! good to know that about the printer, we're going to start looking at some soon. What great instructions you have, way to go!!! !